Mix together the scrambled eggs, cheese and crumbled bacon in a bowl. Spoon filling into center of egg roll wrappers. Wet edges of each egg roll wrapper with water and roll up, pressing seams to seal. Cover with a damp paper towel and set aside. Add vegetable oil to a cast iron skillet and place over medium- high heat until it reaches 350 degrees. Cook egg rolls, 2-3 at a time, until browned on all sides, about 2 minutes. Remove from oil and drain on a paper towel lined plate. In a cast iron skillet, over medium-high heat, add bacon drippings. Add flour, salt and pepper, whisking until all combined. Whisk occasionally as flour mixture starts to brown. Gradually whisk in milk and continue to whisk until it is thick and starts to bubble, adding more milk if it is too thick. Lower heat and keep warm until serving. 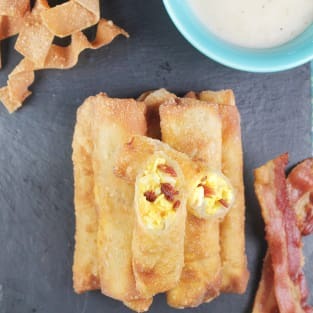 Serve Egg Rolls with Gravy for dipping. Can be stored in a zip- top bag in the refrigerator and reheated in the toaster oven when ready to serve.